A Ping test helps trace the communication between the computer or the router to any websites or devices connected to the network. 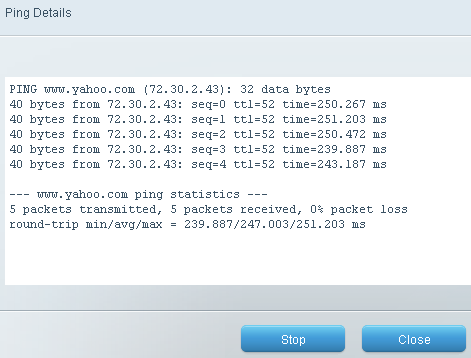 The Ping command can also be used for troubleshooting to test connectivity and measure response time. This article will discuss the steps on how to perform a Ping test on your Linksys cloud account. Follow the steps below to learn more. Enter the IP or host name of the website or devices that you want to test and select your desired Number to ping. Click on the button to run the test. QUICK TIP: Number to ping is the number of times your computer will seek out replies from a website or specific device. You can decide how many replies you want (5, 10, 15 or Unlimited). It is set to 5 by default. NOTE: The website yahoo.com is used here as an example. The window below will then pop up, showing the Ping test results. NOTE: If all 5 packets sent are received, then the connection is working fine. Any lost packets may indicate connection problems. If no packets are received, the replies will either be Destination Host unreachable or Request Timed Out. This indicates that your connection is not routing properly. To know more about the common Ping results, click here. You can expand the range of your Wi-Fi by using other networking devices from Linksys like switches, powerline adapters, wireless bridges, and range extenders. To learn more, click here.